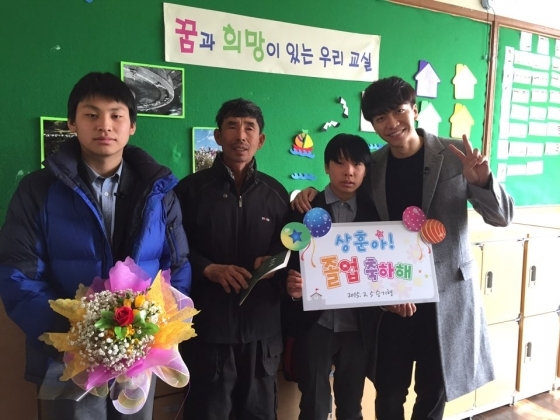 Seung Gi will appear this coming Saturday, 2/21 on KBS1’s Donghaeng, a human documentary series about people in difficult situations who find hope through the help of others. This is a special episode for Lunar New Year which starts on Wednesday, 2/18 and lasts until Sunday, 2/22. There are several press articles about Seung Gi’s appearance on Episode 8 of Donghaeng, one of which I will translate and post later. For now, here are the photos that have been featured online. This episode is about a deaf man who sells puffed grain and his two sons. 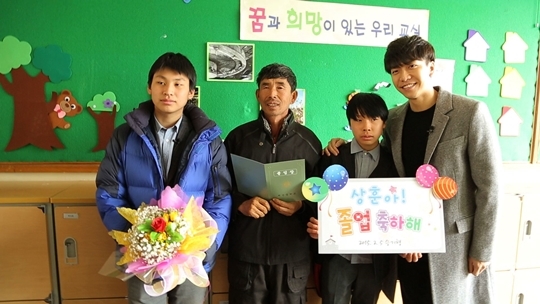 Seung Gi attends his oldest son’s graduation and holds a surprise event for him and his friends. Categories: article, Documentary, Photos, Press, translation | Tags: Donghaeng, Graduation, KBS1, Lunar New Year, translation, volunteer | Permalink.